Discussion Topic: How do we Implement a Change in Practice? 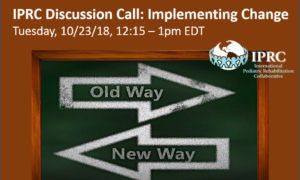 The IPRC Outcomes & Best Practices Committee hosted a discussion call hosted a networking/discussion event on October 23rd, 2018 to discusses ideas, strategies, and how to implement changes in practices. How do you engage staff and colleagues to accept and implement a change in practice? How do you “set the stage” for a new practice or a change in practice? What strategies are most effective for introducing change? What has been effective in making the jump from “knowing” to “doing”? What barriers exist to effective, sustained change in practice? What formats are best to elicit feedback after a change in practice has been implemented? What frequency do you use? How does your organization handle ongoing “continuing education” and mandatory education? How do you ensure that the education is implemented? How do you determine and prioritize which initiatives are given resources? IPRC members may log in to view the discussion summary.